What Do You Do With A College Football Coach With the Following Record: 3-8; 0-11; 0-11; 2-10; 2-5? You fire him. Of course. 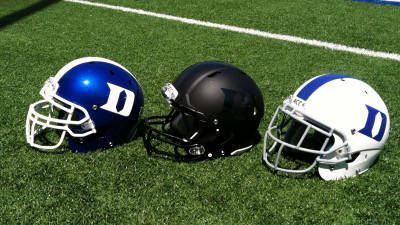 Duke University has fallen on hard times on the football field for, oh, let's say the better part of the past 18 years. Really for most of the last quarter century. Make that the last 50 years. When charts are made of the worst Division-1 college football programs in America, Duke University ranks routinely at the bottom of the list. In fact, dead-last at 119th if you just consider the records since 1995. Stanford has done very well on the gridiron lately. So has little Wake Forest with the perhaps the second smallest college enrollment in D-1, behind Tulsa University. It is hard to say that small colleges with high academic standards can't compete in college football over the past 2 decades, isn't it? 3-8. 0-11. 0-11. 2-10. 2-5. Total record? 7-45 for those of you counting at home. 1 win was over the Div-II Western Carolina Catamounts. 1 was over Rice which was just about as bad as Duke during this period of time. No ACC wins for 4 straight years. In short, it was about as bad as you could imagine. Until halftime against Wake Forest in 2003. When Duke went to the locker room at halftime, they were down by 41-0 to the Demon Deacons of Winston-Salem. 41. to. nothing. After only 30 minutes of play. More than 1.36 points per minute of excruciating drubbing at the hands of an academic and enrollment peer 90 miles west of Durham. On Duke's home field in Wallace Wade Stadium. The decision to relieve Coach Franks, as nice of a guy as he could be, was made by the Duke AD during that halftime. It was just 'too embarrassing' he was quoted as saying. What has this sad story got to do with anything? Well, #1, Paul Ryan's 'budget' is not the budget put forth by Mitt Romney. Mitt Romney of the Republican nominee for President, not Paul Ryan. The truth of the matter is that a President can only 'suggest' a budget each year. Congress has to pass a budget resolution each year (which is not even binding law) and then pass appropriations and reconciliation bills to meet those objectives. It is the 'People's Congress', remember? However, since a President controls the bully pulpit and is the only person elected by the entire nation, it is incumbent upon him (or her one day) to put forth a blueprint, a priority list and 'lead us' all towards some mutually beneficial goals as a nation. Such as a balanced budget. Lower spending. Less national debt. Lowered chances of everything spinning out of control from inflation to higher interest rates to a massive devaluation of the dollar, you know, those kind of things. Not 'leading us' from the White House to avoid all of these adverse outcomes down the road is truly 'dangerous', 'irresponsible' and 'crazy'. Inflation and high interest rates are non-discriminatory and 'regressive' as heck because they destroy the lives of people on low or fixed incomes faster than those who are not. Let's look at the record of our current 'Head Coach' in the White House, Barack Hussein Obama, 44th President of These United States of America. $5 trillion of new debt being loaded up on your children, children's children and children's grandchildren to be paid back one day, somehow. His bailout of the Detroit automakers now looks like it will cost the America taxpayers $25 billion in losses due to the swooning stock price of GM. His $1 trillion of economic stimulus didn't stimulate any economic growth or new jobs that anyone can really put a finger on. The one time when President Obama actually had full discretionary authority in his own hands to reduce future deficits by over $3.7 trillion, he blinked. He could have not signed the extension of the Bush 43 tax cuts as of December 31, 2010 and every tax rate would have reverted to the Clinton-era tax levels President Obama so admires. Boom! $3.7 trillion in lower deficit projections for the next 10 years. President Obama had it in his power to do this...and he whiffed. He created the Bowles-Simpson Commission to come up with a viable solution to our nation's most pressing problem. They did it and presented it in December 2010. President Obama took one look at it and punted the ball on first down and then ran out of the endzone faster than Forrest Gump. He didn't even have the guts to introduce his very own commission's recommendations in the next year's budget submission to Congress. He whiffed. Again. Between signing the W tax cut extension ($3.7 trillion) and not agreeing to the Bowles-Simpson recommendations of $4 trillion in deficit-reduction, President Obama allowed close to $8 trillion in new debt to be created over the next 10 years. Congratulations! Those are two of the biggest whiffs on fiscal discipline in modern American history! $8 trillion in more debt for our youngsters to deal with. He could have vetoed the $1 trillion stimulus package as President...but...he introduced it in the first place! So how could he have vetoed his own bill? He could have vetoed Obamacare that is now estimated to cost 'only' about $2.2 TRILLION more than when first scored by CBO when passed in March 2010 but, hey! wait a minute! That was his bill as well! A President can't veto his own legislation, now can he? His Cash for Clunkers program might go down as one of the most-misguided federal public policies of all time, almost close to Gerald Ford's 'Whip Inflation Now!' (WIN) campaign. 'Clunkers of Legislation' would be more appropo of most of the Obama term in the White House. We could go on and on and on but it would be like watching replays of the Coach Carl Franks weekly television show from 1999-2003 which was as painful as picking burrs out of your feet from walking across the hot sand at the beach to your cottage barefoot. This recounting of the ways President Obama has failed as a fiscal manager of the national fisc is 1000 times more painful, wouldn't you have to agree? We used to think so as well based on his family and wonderful young daughters and all that. However, any person who would allow and encourage such ads as the ones leveled against Mitt Romney for allegedly 'murdering' a woman when one of the Bain investments went sour and the business was closed, and not even publicly denounce whoever did it (it was David Plouffe, one of his closest political advisers and head of Priorities USA), well, that makes you wonder just how 'wonderful' of a person President Obama must really and truly be, doesn't it? Campaigns reflect the morality and character of the candidate at the top. We had the honor of being intimately involved in 5 large-scale campaigns over the years, 4 with former Congressman Alex McMillan (NC-9) and US Senator Elizabeth Dole in 2002. 'If I can't win based on my record and positions on the issues, I don't deserve to be elected'. They are both great people. As were their opponents, D.G. Martin who ran against Mr. McMillan in 1984 and 1986 and Erskine Bowles who ran against Elizabeth Dole in 2002. We are much more concerned, however, about what a candidate or President does and says about the federal budget and the economy than any nasty comment they can say about someone from their childhood or business past. Those things just 'don't matter' when we have close to 20 million Americans un-or-underemployed today and a national debt that is exploding like a mushroom cloud over our future. We think we have hit the national equivalent of Duke versus Wake Forest, down 41-0 at halftime. We think President Obama's record on the budget and the economy is worse than the 13% 'winning' (sic) percentage (more like the 87% 'losing' percentage) of Coach Carl Franks. We have not seen any inclination on his part that gives us even one scintilla of hope that he would all of a sudden change his stripes during a second term and become a 'budget hawk'. He has already allowed close to $12 TRILLION in more debt accumulation to occur by his inaction and active pursuit of more spending during his first 4 years as President. Want to go for another $12 trillion to get it to a full $24 trillion by the end of his second term? We think the American people need to admit that a change is needed, even if you think the head coach is a 'nice guy'. Coach Carl Franks could not have been a 'nicer person' people who knew him would say. It is more than 'embarrassing'. It is 'dangerous', to your economic future and the future of your children and grandchildren to allow President Barack Obama 4 more years of inaction on the biggest crisis we face as a nation today, the federal budget and exploding national debt. 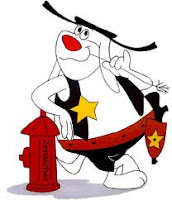 We actually think Deputy Dawg could do a better job policing the growth in federal spending than President Obama has exhibited these past 4 years. He has had his chances and has repeatedly abrogated his responsibility to lead and to do what we elected him to do: solve this amazingly huge problem of federal over-spending and national debt. You can vote for President Obama based on other issues if you wish. But if you are serious about containing federal spending and consider yourself to be a fiscal conservative and want your children to have a better future with less debt to repay, you have no choice but to 'fire him' and not renew his contract for another 4 years as Budget Commander in Chief. Just as Duke University had to fire Coach Franks after the halftime debacle of 2003 and keep looking for someone, ANYONE! who can bring Duke University back into the conversation as even having a Division 1 BCS Bowl Series football program. Coach Cutcliffe: Here's hoping Peyton or Eli Manning has a son coming to play QB at Duke pretty soon for you. Character still counts. We don't know what crises we may face in the future so it's important to elect someone we trust. As to why a UNC graduate would attack Carl Franks and Duke football in an attempt to argue that we should vote for Mitt Romney, it's hard to respond without sinking to the same level. Character didn't count when Duke fired Carl Franks. By all accounts, he was and still is a wonderful person. He just either couldn't recruit or coach well or both...so he was fired. Same thing with President Obama. He might be a great dad and a great person....but his record as President is abysmal. As was Jimmy Carter. Who wound up being the best ex-President we have ever had for his humanitarian work and Habitat for Humanity and all that. I actually grew up in a solid Duke football family so using Coach Franks seemed to be a natural comparison to what used to be a proud athletic tradition at Duke University.